It was not until the middle of the 1990’s that the Amiga entered the world of texture-mapped 3D gaming. 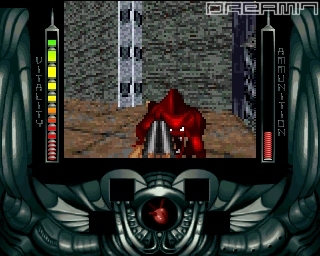 The users demanded games similar to Wolfenstein 3D and Doom on their Amiga. This unleashed a storm of releases. Gloom, Breathless, Testament, Nemac IV, Behind the Iron Gate, Fears, Death Mask and many more hit the shelves at local retailers or was available from mail order companies.Team 17, a company known for high quality titles like Superfrog, Project-X and Worms, decided they wanted to be part of the 3D revolution on the Amiga. With Ocean as the publisher, the ball started rolling. They entered the competition with a game called Alien Breed 3D. It was, as the name indicates, based on the old Alien Breed series that captivated players worldwide in the first half of the 1990’s. With such a foundation to build a new game on, things looked quite promising. The various Amiga magazines of the time, like Amiga Format and CU Amiga, were filled with previews and information concerning the upcoming game. The expectations were high. Did Alien Breed 3D deliver the goods? Did Team 17 accomplish the difficult task of recreating the atmosphere and playability from the former games in the series? 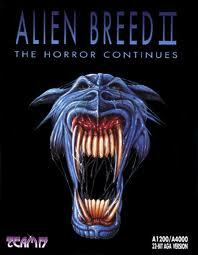 Alien Breed II - Old classic, scary box art! 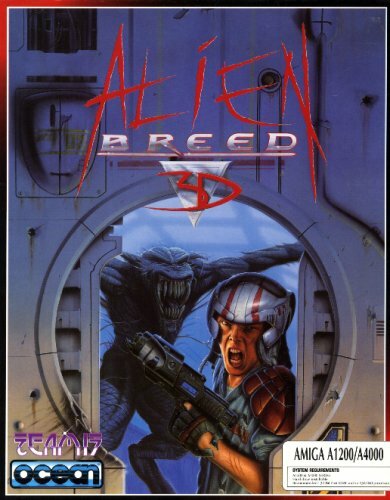 There are two versions of Alien Breed 3D available. One for the Amiga 1200 and one for the CD32. None of them require any add-ons. This means that the game works well with a 14.7 mHz CPU. That is a fine accomplishment and a testament to the skill of the programmer. Alien Breed 3D can be installed to a hard drive, which is great if you don’t want to use floppies. The CD32 version doesn’t contain any extras unfortunately. It is a bit sad that Team 17 didn’t throw in some goodies for CD-ROM users, but that seems to have been the general trend concerning CD32 releases. Let’s dive into the game itself. The first thing you’ll notice is that the visuals can seem a bit blocky. This is especially true if you compare it to modern games. The reason is that the texture-mapping 3D engine runs in 2×2 pixel mode instead of 1×1. I reckon that the developers thought it was better to focus on speed to spruce up the gameplay rather than sacrificing it on the altar of eye candy. Personally I think this was the correct choice at the time. Even if it seems a bit blocky, it looked quite nice for its time. It did also make it possible for everyone owning an Amiga 1200 or CD32 to play Alien Breed 3D without shelling out for a turbo-card. The overall graphics are nicely drawn and there are many different environments for you to explore. The audio is important in first person shooters, as it plays a very important part in creating the atmosphere of the game. Without decent sound effects, the game can lose some of its appeal. Team 17 have done everything correct in this department. On your way through the levels, you’ll hear frightening screams from your enemies. If you turn off the light in your room and play the game, I’ll bet you’ll feel a shiver through your spine.. Excellent stuff! The controls are pretty straight forward and easy to learn. 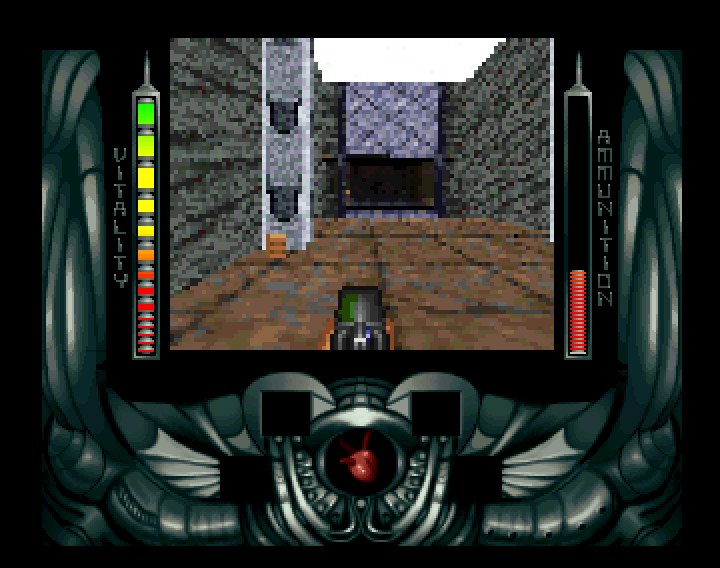 If you play the CD32 version, you’ll have the advantage of using a joypad. For us Amiga 1200 users, you can utilize the power of the keyboard. As in Doom, Gloom and other first person shooters, side-stepping is your friend and your key to salvation. We’ve now covered the graphics, sound and controls. How about the gameplay? With Alien Breed 3D, I feel that Team 17 puts gameplay first. The game is both fun and frightening at the same time. The combination of graphics, sound and controls is very good. You’ll have to prepare for a tough challenge in completing the levels though, but I think that is a bonus. It makes the game last longer and it feels rewarding when you finally nail that difficult stage. Another plus is that there are many different weapons to choose from. You start of with a simple plasma thingie, but soon enough you’ll be wielding stuff like a double-barreled shotgun. Let’s go back to the question we started out with. Did Team 17 deliver in respect to the old Alien Breed games? Some might disagree with me, but I think they did a fine job. Walking around in the corridors and fighting off dangerous aliens brings forth a similar feeling that I got when playing the older games in the series. Both the atmosphere and playability can be found in Alien Breed 3D. The game was also well received by Amiga gamers in general. All in all, Alien Breed 3D was a fine game for its time. It was, like Gloom, one of the first texture-mapped 3D games for the Amiga. Some people said the Amiga wasn’t capable of running such games. Team 17 proved them wrong with this game. If you like blowing aliens and/or monsters to pieces in a 3D environment with a scary story and atmosphere, Alien Breed 3D is for you. Personally I recommend trying it out, as it is quite an entertaining game. Have fun! Download Alien Breed 3D from Planet Emulation by clicking here. Thanks for commenting. 🙂 I was going through some of my old posts and noticed that I hadn’t commented on this one. Sorry for taking such a long time to answer. Amiga was cool when it come to non-texturemapping 3D. I’ve seen some really stunning stuff in demos and games. I remember at that time, I could see Breathless and this title the same time, but Breathless was better (for me). So I had no problem playing Breathless and Alien Breed 2D (especially Tower Assault). Until appeared Alien Breed 3D 2 The Killing Grounds … that’s another story. For me Alien Breed is one of the great Amiga classic, I love his soundtrack … even took him on the phone. Many thanks for commenting. Sorry for late reply though. Breathless was awesome when it came to graphics. Gameplay was not bad either. It did also have the innovative feature of looking up and down.. I remember telling PC-gamers that you couldn’t do that in Doom.. hehe..